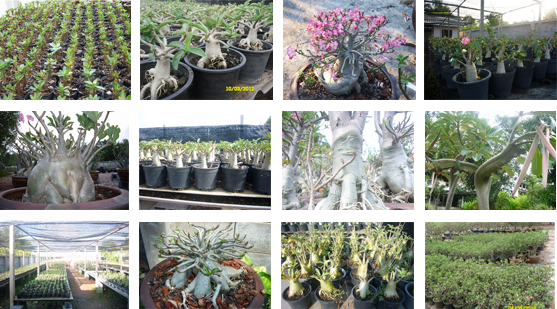 We are Thailand’s leading Adenium exporter, producing and distributing fresh Adenium seeds and seedlings to all over the world! Because of attractive forms, various blooms and species, Adeniums or Desert Roses have become well-known and popular among plant lovers and collectors since 1990s. Recently, Thai breeders and growers can pollinate Adeniums’ flowers by hands, leading to a wide variety of hybrids. 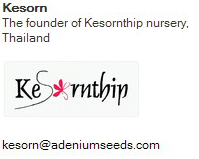 We are one of the most successful Thai growers who can produce a high volume of quality seeds. 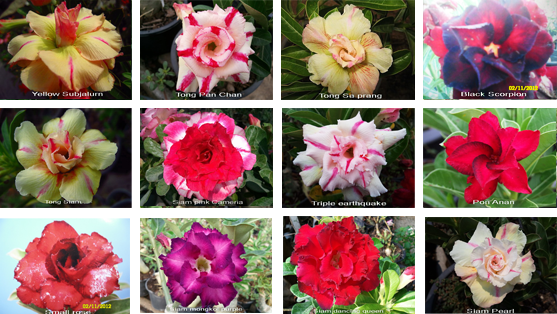 We have our own nurseries and gardens where a wide range of Adenium species are carefully cultivated for export so that we can ensure high quality and the freshness of every seed we sell. Our customers are in many countries around the world such as The United States, France, Australia, and Indonesia. Our web site is being developed to be an alternative online community for all adenium lovers regardless of skill and experience. This web site is also a new channel to meet our customers interested in our products. We are willing to support all adenium lovers with our experience and knowledge, hoping that growing Adenium could be an enjoyable experience for everyone.